On the 12 of August we are going to move house and I am really excited. But the bad thing is that we haven’t finished packing yet. I can’t wait but I will miss my friends and I will love having my school friends by me. That means I can have my own room so I won’t have to share with my brother. Racing for Great Britain at the world championships. At the start of the month I raced in the British series in Derby and following a big crash I managed to finish 4th in my Final. On Sunday I raced in Bideford and after a win in my moto’s I finished 2nd in the Final behind my good friend Taylor. This weekend I sail to Rotterdam in Holland after being selected for the Great Brirain squad for the World Championships. It’s going to be hard but hopefully I can finish inside the top 32 in the world! 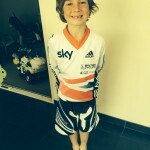 Here is a picture of me in my Great Britain kit. I went swimming it was cold. we went to the frome leisure center . I swam 10 lentghs ……. that’s a lot!!!!!!!!! It was fun. I went with my mum it was great!!!”!!!!!!!!!!!!!!!!!!!!!!! !